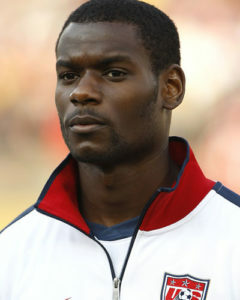 OFF the back of lifting the SPL title for the second time in succession, Maurice Edu and DaMarcus Beasley won places in the United States squad for the 2010 tournament in South Africa, while Madjid Bougherra made the Algeria team. Both nations were drawn in Group C alongside England, who were captained by Steven Gerrard, and also Slovenia, who were making their tournament debut. The opening game of the section got off to a great start for England, with Gerrard scoring inside four minutes. However, a blunder from goalkeeper Robert Green allowed Clint Dempsey to equalise for the States who left both Edu and Beasley on the bench for this one. Meanwhile, a day later, Bougherra’s Algeria were on the wrong end of a 1-0 loss to Slovenia, meaning they needed something from their second game with England. And, ‘something’ is exactly what they got. Gerrard, as he did throughout the tournament, captained England, but he couldn’t lead them to victory as a well-marshaled defence, led by Bougherra, claimed a 1-0 win. Edu got his first taste of World Cup action in the States’ match against Slovenia, where he came on as a half-time substitute with them trailing 2-0. Landon Donovan and Michael Bradley netted to pull back a 2-2 draw to set up a dramatic final matchday. Wins for any of the four nations could have seen them through, and in the end, it was the USA and England who progressed. America, this time with Edu in the starting XI and Beasley coming off the bench, scored the only goal of the game in injury-time through Donovan to break the hearts of Bougherra and Algeria and send the US through as group winners. England also made it through, with Jermain Defoe grabbing the only goal of their game with Slovenia, though their profligacy in front of goal cost them with the US finishing top on goals scored. The adventures of both nations continued no further than the Last 16, however, with the USA knocked out by Ghana and England eliminated by their old foes Germany. The States, with Edu coming on as a sub in the 31st minute, had the chances to progress, and despite Donovan again grabbing an equaliser, Asamoah Gyan netted a winner in extra-time. England, in their match, were humbled 4-1 by the Germans, although at 2-1, a Frank Lampard shot crossed the line but wasn’t seen by the referee or his assistants. Elsewhere of a Rangers interest, Giovanni van Bronckhorst captained The Netherlands to the final of the tournament, where they were beaten 1-0 by Spain after extra-time in a very bad-tempered affair. Bruno Alves made his World Cup bow for Portugal, and played every minute of every game for them before they were beaten 1-0 by Spain in the Last 16. Vladimir Weiss, who would come to Ibrox later that summer on-loan from Manchester City, played in three of Slovakia’s four games at the tournament, although they were knocked out by the Netherlands immediately after the group stage. 2014, with Rangers playing League One football, was the first time in 20 years no players from Ibrox were selected for the World Cup. Our current manager, Steven Gerrard, did however travel to Brazil for his final major tournament with England, and again, he was handed the captain’s armband by manager Roy Hodgson. There wasn’t, however, to be a happy ending for Gerrard, nor for England, who were eliminated after just two matches. A 2-1 defeat to Italy in the heat of Manaus, coupled with a surprise 3-1 win for Costa Rica over Uruguay meant they would have to avoid defeat to the Uruguayans in their next match to avoid elimination assuming there would be a winner in the Italy versus Costa Rica match. After equalising a Luis Suarez opener through Wayne Rooney, Suarez netted again for Uruguay with five minutes left before another shock win for Costa Rica meant England were heading home, with Gerrard only coming off the bench in their dead-rubber 0-0 final game against the Costa Ricans. That was the final one of his incredible 114 caps for his country. The other match between Uruguay and Italy (which Uruguay won 1-0) will always be remembered for Luis Suarez’s bite on Giorgio Chiellini, which was missed by the referee. His punishment, however, was a nine match international ban and a ban from all football from four months. Elsewhere, Bruno Alves played every minute for Portugal, but they were also knocked out of a group containing Germany, the USA and Ghana, with the US team containing former Gers’ DaMarcus Beasley and Alejandro Bedoya. 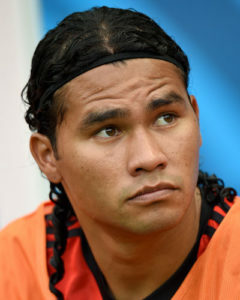 The group stage match between Mexico and Croatia also had some Rangers interest, with Carlos Pena coming off the bench for the Mexicans in a 3-1 win, while Nikica Jelavic was used from the bench for the Croats. That would be the only appearance both men made in Brazil.